The primary function of a rotary seal is to retain the bearing lubricant and, secondarily, to enhance the performance and life of the bearing by minimizing dirt, oil and water ingress that leads to damage and premature failure of the bearing and other components. Call 1-800-283-7140 for quick answers to your questions. Availability Most standard or non-standard and application-specific designed rotary shaft seals, in inch or metric sizes, are available with a 1-4 day turnaround. 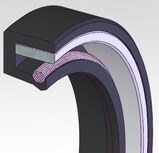 For your unique or special rotary seal application, contact our engineers to help you in specifying a seal that’s best suited for your situation. * Maximum values depend on seal material, seal configuration, media, temperatures, pressures, surface speed and working environment. For maximum seal life expectancy, do not operate your seal beyond 75% of its operating limits. Please consult our engineers or call 1-800-283-7140 for advice.